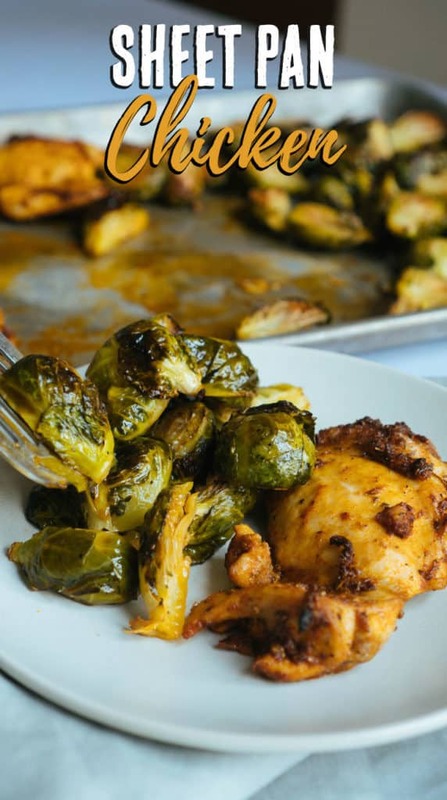 One Sheet Chicken Dinner | Peri Peri Chicken And Brussel Sprouts! 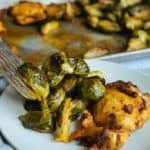 Feeding a family or remembering to meal prep for the week are two very difficult things we deal with on a day-to-day basis, which is why we created this One Sheet Chicken and Brussels Sprouts Dinner for you! It takes 30 minutes in the oven and feeds four people or feeds you for four nights. We've jazzed up the chicken with a homemade peri peri rub and combined it with the heartiest vegetable out there, brussel sprouts! We love one sheet pan meals for weeknights because they are easy prep and easy clean up. Plus, the meat and veggies cook at the same temperature in the oven. It doesn't get much easier and all you have to do is swap out the meat or veggies and change up the seasoning to make your family think you went above and beyond for dinner that night. You can feel good about feeding your family and have more time to spend with them when making one sheet pan meals. Our Favorite Meal Prep Dinners! A lot of our recipes are designed to translate perfectly over to meal prep for the week! We've found that meal prepping has not only helped us stay accountable, but gives us more time to be productive with work and spend time with one another. Busy days call for meal prep, so I want to share some of our favorites with you! Macro Muffins and Egg Cups are the perfect grab and go breakfast! Our Keto Chili is the perfect work desk lunch or dinner for any night of the week. Keto Bread and Low Carb Rolls are the perfect side dish to amp up any meal or perfect for making sandwiches! Any way you decide to meal prep, you can't go wrong because you'll always be prepared with a satisfying meal! One Sheet Chicken Dinner For Four! 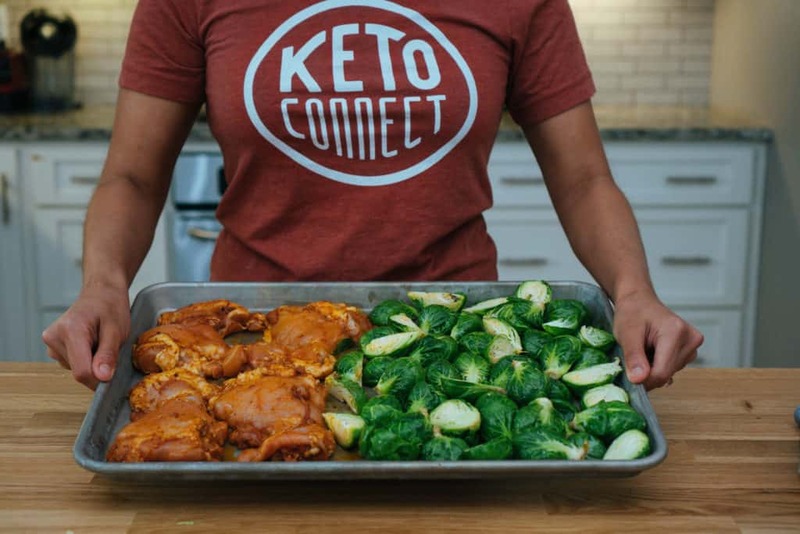 Recipe can be quickly added to MyFitnessPal - Search "KetoConnect - One Sheet Chicken Dinner"
Make the rub: combine all the peri peri seasoning in a small bowl and set aside. Place the thighs in a large mixing bowl and coat with olive oil and the rub and coat thoroughly using your hands. Set aside. Cut all the brussels sprouts in half and add to a large mixing bowl. Coat with olive oil, salt and pepper and toss until thoroughly coated. Place the chicken thighs on one half of the the sheet pan (no need to grease or line with parchment paper) making sure they have a little room between them. Layer the brussels sprouts on the other half of the sheet and spread out to an even layer. Bake for 30 minutes in total. 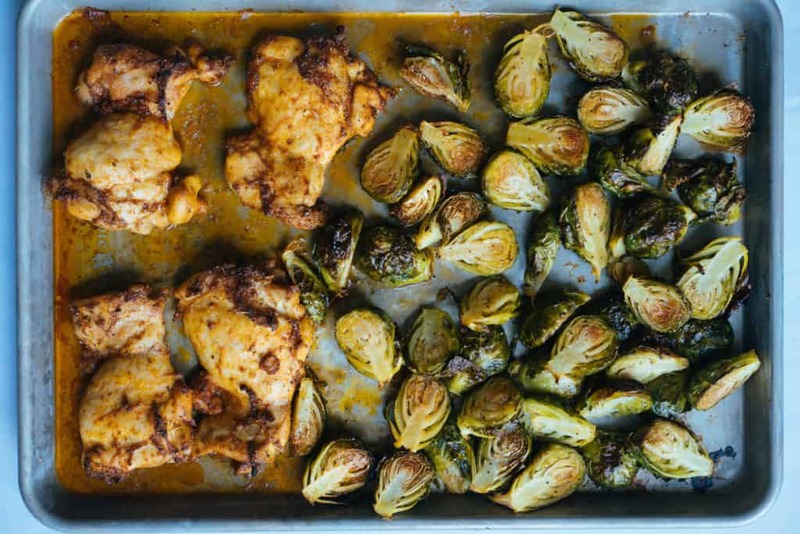 At the 20 minutes mark pull out the sheet pan and flip the brussels sprouts and finish baking. Store leftovers in a sealed container in the fridge up to 5 days.